It’s harder for investors to differentiate between similar companies, and it’s hard for consumers, too. How are you going to educate consumers so they can differentiate between companies that might all appear to be selling the same thing? The key differentiator between who the winners and losers are in the industry are those who can build brand equity for themselves. What makes a great brand? What appeals to you? Ultimately we’re dealing with cannabis. You know, it’s not a molecule that's exclusive to any one person...The cultivator has to decide what their brand stands for, whether they want to be the lowest cost producer or the highest quality connoisseurs’ choice, very pharma focused or rec focused. Then, it’s how do they execute that branding strategy? If you’re not thinking about your brand at all, then you’re going to have a really hard time differentiating your product from other people’s products, especially when the marketing and advertising prohibitions in the Cannabis Act take hold. As of March 31, Canada had 167,754 registered medicinal marijuana users – triple the amount from a year earlier. In one sense marijuana is a unique market for investors as there is the legal market and Black market. I believe it fits ideally into the 'S curve' used in technology innovation. In technology the early days are called adaption, that is where a new technology is accepted by the market and it's growth from that point is the most astonishing as it climbs the 1st part of the 'S curve'. If a technology has a 5% market penetration and moves to 20%, that is 300% growth. This high growth rate continues many years until you get over 50%. If the market grows from 50% to 75% penetration the growth has slowed to 50%. This was one of the tools I used to predict the market top of 2000. At that time the new technologies were the computer and internet and they moved up to around 70% market penetration then - so the big growth was over. Some where between 50% and 75% adaption you have the 1st big consolidation, as growth slows, usually over supply and price competition increases. The growth bubble deflates and many companies fail and a few pick up the pieces and become the market leaders. That 1st consolidation in the internet/PC 'S' curve happened in 2000 and today after the 2000 meltdown we have the Amazons, Ebays, Googles and Facebooks emerging as the internet leaders. The big mistake many investors are making in the Marijuana market is that they think it is too frothy and over priced. This really is because growth is strong as we are at the beginning of the 'S curve' so we are seeing that effect. However we are a very long way from the 50% penetration level. In Canada I estimate we are between the 5% to 10% market penetration so have a long way to go with strong growth. The euphoria in the market is really based on the fact we have reached the acceptance phase. We know it is going to be adapted and grow. With internet/PC we knew the ideal penetration is 100% of the populace but that will not happen with POT, as it will be more like the alcohol or cigarettes as only a portion of the population drinks or smokes. So we need to measure the market adaption of POT usage sector only. Most believe that Canopy, TSX:WEED is a major leader now in Marijuana production and I would agree. Their revenue in the last reported qtr was $C9.3 million. Philip Morris is a leader in the Tobacco market and their revenues was US16.6 billion in the last qtr. If Canopy for POT could catch up to Philip Morris for Tobacco as a market leader in their sector, their revenue needs to increase about 2,400 times. You see some potential here? Philip Morris is global but in time so could Canadian POT producers. This is what the vast majority of investors fail to grasp, is the size and scope of this market and where we are in the adaption or growth cycle. With POT, there is no need to develop a market, it is already there but is a black market in most instances. The real question is what is the current market position and where are we on the 'S' curve. This is the most important thing to understand in this market and I spent a lot of time trying to find the best answer. If you are long POT stocks you will like this answer. Currently as a POT producer, Canada is a leader and most of us invest in the Canadian POT producers so I am going to limit my analysis to the Canadian market. In general we know the U.S. is about 20 times our size in Canada. Between four million and six million Canadians will use cannabis recreationaly next year, says Health Canada, drawing on estimates from both government and private sources. So using the 170,000 and 5 million potential market, currently there is less than 1% market penetration. In about a year there will be legal recreational POT use in Canada and there will be a supply shortage. I have no doubt about that and a shortage would compromise one of the government’s major goals in legalization: stamping out the black market. Knowing this, in late May, Health Canada announced it was streamlining the process and almost doubling the number of staff assigned to review applications for growing licenses. The changes also make it easier for the 45 existing producers to expand. But we do not need to forecast, we only need to know where we are now on the 'S curve' and follow the progress to 50% or more and I expect that is 3 to 6 years away and there will be around 500 to 1,000 producers at least by then. We know it will be at least three years for substantial production growth and that will not be near enough. 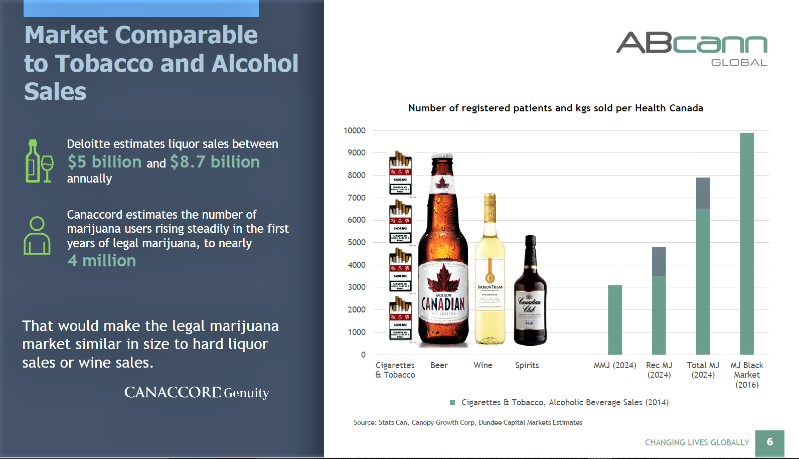 ABcann, another Canadian producer has some good graphics in their presentation, below compares to alcohol and tobacco market so a good picture of the potential market. Note by 2024 we could see this market near it's potential. 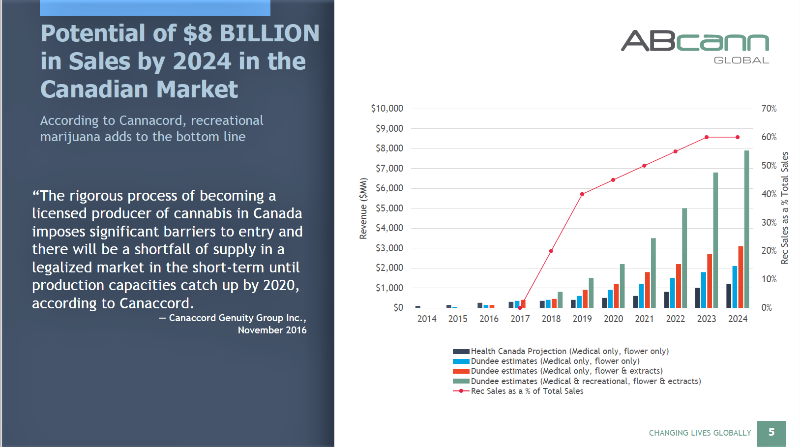 https://www.forbes.com/sites/debraborchardt/2017/04/13/canada-takes-big-step-towards-creating-8-billion-legal-marijuana-industry/#493be31d24ebDeloitte estimates the market has a base retail value between $4.9 billion-$8.7 billion, which would rival the size of the Canadian spirits market, which is $5 billion. I believe the estimates could be low because not everyone would answer honestly if they use marijuana. Even so to meet the low end of the estimates for the adult-use market, Canada would have to produce over 600,000 kg of cannabis a year. In Ottawa paper, Health Canada predicts 655,000 Kgs usage when it becomes legal. A better estimate would be in the middle of the Deloitte numbers and that would be 840,000 kgs. Aaron Salz was the first investment analyst on Bay Street to specialize in Canada’s cannabis industry, and is now a consultant to some of the big growers. He estimates the current market is producing 80,000 kgs, so that would mean 9.5% market penetration. As the market develops we will get more and better forecasts plus actual data and it should be easier to measure market penetration. Above when considering the registered users, they probably use more than average if they went to the trouble to get medical approval, so maybe is a factor why that penetration level was low, less than 1%. No matter how you slice and dice numbers I believe it is very accurate to assume we are between 5% and 10% market penetration in Canada. This means we are at the bottom of the 'S curve' but we have acceptance of this market. This is the best place to be on the curve and means we have seen nothing yet as far as growth and even more higher valuations on the POT stocks. presentation, note where we are now in 2017 compared to expectations to about $8 billion market in 2024. It also shows currently between 5% and 10% market penetration. For Cannabis Wheaton and the Canadian growers, all the growth potential is still years ahead of them. By the time we hit 50% market penetration, the revenues at these Canadian producers will multiples of todays numbers. Just look at Canopy numbers a day or two ago, 50% higher than previous qtr. and 191% higher than a year ago. More investors will get convinced in as the big growth in this market is just starting. I will not be surprised to see Canopy, Cannabis Wheaton and Abcann among others to see stock prices of $50 to $100. When smartphones started we got into RIM at $7.00 around this level on the 'S Curve'. We sold out at $100, but the stock actually went to $200. Smartphones are a bigger market but you can still assume 15% to 25% of Smartphone users probably also use marijuana, more so younger generation. The National Post reports in its Tuesday edition that Manitoba's Finance Minister says he is feeling rushed by the Trudeau government's July, 2018, timeline for legalizing recreational marijuana. A Canadian Press dispatch to the Post quotes Cameron Friesen as saying Monday that with the clock ticking there are still many unanswered questions on issues like public safety, enforcement and finding legal supplies of marijuana. Provinces, he argued, are responsible for much of the work and the "very real" costs needed to create a regulated cannabis market. Speaking in Ottawa before a federal-provincial finance ministers meeting, Mr. Friesen said he had already raised the idea of an extension with federal Finance Minister Bill Morneau. Mr. Friesen told reporters before entering the meeting, "This is a very significant shift in how we'll operate and we need to have that adequate time to develop the tools that we will need as a province to be able to implement this the correct way." Finance ministers are meeting to discuss several economic issues, including how best to tax the legal pot industry. Pot taxation is expected to stay low to ensure the regulated market is not overpriced compared with the black market.